It's almost certain that some 20,000 people will want to enjoy the first game at Arteveldestadion, new venue envisaged almost a decade back. With the long wait expectations are high, but fans may also need to expect traffic chaos. The R4 route leading to the new stadium will only be done in January 2014, meaning KAA Gent are to play half the 2013/14 season with compromised access. To add to that, there will only be some 1,200 parking spots available and reserved primarily to VIPs, media or officials. Scenarios of how to minimise obstructions are being developed currently. 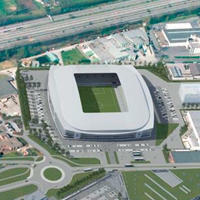 Already the club advise using bicycles for access, as the stadium will provide room to safely leave some 2,500 of them. Additional parking spaces (some 900) are to be found around the stadium's neighbouring businesses and only cars with no less than 3 people inside will be allowed in. This limit is expected to discourage people from taking a car for just one person.